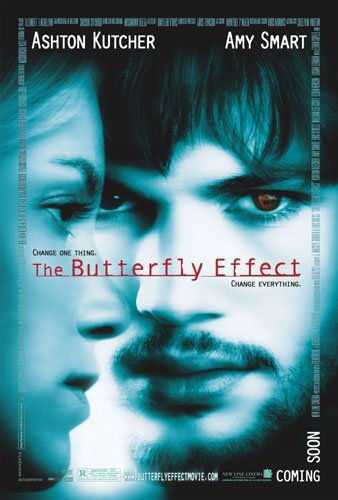 If you liked revisiting the innocuous yet important details in the Sixth Sense, the complicated, non-linear narrative in Memento, and the logical twists of changing the past in Frequency, you'll like The Butterfly Effect. But you have to ignore everything you know about the lead actor, Ashton Kutcher. Ignore The 70's Show. Ignore Dude, Where's My Car. Ignore his boy-toy status with Demi Moore. Kutcher can act. He plays his first serious role far better than the critics expected. Kutcher plays a young man named Evan. The story follows him through the traumatic events of his childhood to his college years. As a college student, he discovers that he can change what he doesn't like in his present by sending his consciousness into the body of his past selves. That's when the fun begins. Since the story is told from Evan's restricted point of view, the audience gets to learn along with him how to solve the conundrums of his own making. These conundrums happen because of the Butterfly Effect, an observation first noted by Edward Lorenz, an American meteorologist, who mathematically modeled the climate. The Butterfly Effect is the propensity of a system's sensitivity to its initial conditions. Over time, the system becomes increasingly unpredictable as tiny changes result in bigger and bigger consquences with each iteration. When applied to real world phenomena, the idea that a butterfly flapping its wing can cause a tornado on the other side of the world is not so far fetched. In the movie, Evan's life is the system in question. He keeps tweaking his past in the hopes of perfecting his present. But his plans go awry. The woman he loves, Kayleigh, switches from a going nowhere waitress to sorority princess to crackhead prostitute to his best friend's girl. His life switches from straight-A student to cheating frat boy who turns into the new fresh meat in prison to an wheelchair bound armless paraplegic. His nemesis, Tommy, and his best friend, Lenny, even his mom and his dog flip their fates with equally wild abandon. Evan finally figures out how to maximize the happiness of the people he cares for by sacrificing some of his own. Even so, the story ends on a hopeful note. In every alternative reality, everyone comes back to touch him somehow, including Kayleigh. After the movie, I spent the better part of the night lying in bed and trying to figure out what the details meant. Like why little Evan blacked out during the climax of the most seminal moments of his life. Those black outs are when the older Evan came back to change his past. Like why Evan's hair style and general appearance hardly changed with each alternative reality. He remembers all the alternative realities while the other characters are oblivious to them. Their appearances change radically. Evan's does not. Evan's consistent appearance is a visual reminder to the audience that he is the only constant. Complicated plots are the staple of the time-travel genre. The Butterfly Effect is no exception. As such, the screenwriters missed a few things. Sorority Girl Kayleigh notices changes in Evan that she shouldn't have. Frat Boy Evan goes to jail when he should have gotten off easily on a self-defense plea. One of the fixing-the-past scenes must have been left on the cutting room floor. Seven year old Evan can't remember drawing a surprisingly well-composed picture of him standing over the dead bodies of his classmates with a bloody knife. This sick drawing is what set into motion his journal writing which then became the media through which his college-aged self could journey into the past. Surely the older Evan seeded this event with his intervention. The first and concluding scenes that present the final solution to his optimization problem is a deux machina. Despite these flaws, some minor, some not, I was absolutely riveted to the unfolding story on the big screen, even to the point of accidently tossing the popped corn when I jumped in my seat. There are some very disturbing moments. Had the overall film not been so good, I would call them gratuitously shocking. Is this is good movie? When an hour and a half of not blinking has given me something ponder the next day, the answer is YES.